Quantitative differences in gene expression are thought to contribute to phenotypic differences between individuals. 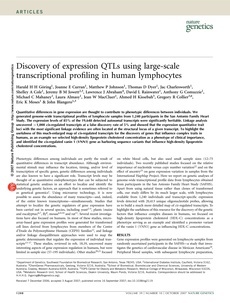 We generated genome-wide transcriptional profiles of lymphocyte samples from 1,240 participants in the San Antonio Family Heart Study. The expression levels of 85% of the 19,648 detected autosomal transcripts were significantly heritable. Linkage analysis uncovered > 1,000 cis-regulated transcripts at a false discovery rate of 5% and showed that the expression quantitative trait loci with the most significant linkage evidence are often located at the structural locus of a given transcript. To highlight the usefulness of this much- enlarged map of cis-regulated transcripts for the discovery of genes that influence complex traits in humans, as an example we selected high-density lipoprotein cholesterol concentration as a phenotype of clinical importance, and identified the cis-regulated vanin 1 (VNN1) gene as harboring sequence variants that influence high-density lipoprotein cholesterol concentrations.